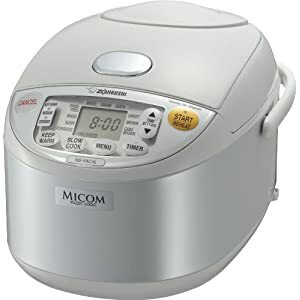 The Sanyo ECJ-M100S is the most affordable Micom rice cooker on the market today. Typically these devices start at around about $100 for the basic models. But this low priced unit blows them away with an even lower price tag. The design of this machine is different from the majority of the other Micom units. However as far as functionality is concerned, there is not much to set them apart. In fact, if truth be told, this budget model actually has some features that most other rice cookers do not have. This may well be the best rice cooker for a family who want to eat the highest quality rice but want to do so without spending a fortune. As you can see from the picture above, this is a stainless steel design. This could be an attractive addition to any kitchen. This machine is in fact a 10 cup model. So it is able to make enough rice for almost twenty persons. 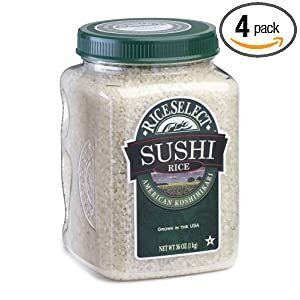 If you live alone and want to make small quantities of rice, this might not be the best option. A smaller model would probably suit you better. Sticking with the same brand, a Sanyo ECJ-S35K might be quite a nice option. Turning our attention back to the Sanyo ECJ-M100S for now, this is a machine that can cook all kinds of rice. It has cooking options for white rice, brown rice, sushi rice, rice porridge, mixed grain rice, sweet rice, sprouted brown rice, rinse free rice and a quick cooking option. In addition to this, it can be used to make soup using its slow cook setting, steam vegetables and even bake cakes. So when compared to other more expensive models, it certainly does offer good value for money. You can find the best price Sanyo ECJ-M100S at Amazon. The list price on the Sanyo website is, at the time of writing, $79.99 so you should expect to find it for less on Amazon. The device comes with all the standard accessories, a 180ml rice measuring cup, rice spatula and a spatula holder. I also like the fact that the inner lid comes out. This is standard on more expensive machines and it is really handy to help get your rice cooker cleaned thoroughly. This is especially useful when you are cooking anything more complicated than plain rice.